Faux Suede. Grey to Light Black. Nice dress shoes with a stacked leather, 3.5 inch heel. Cap toe, lace up. Slip resistant sole. "Pre-Owned shoes aren’t perfect. Shoes are in Excellent pre-owned condition. Minor wear and creasing. See pictures for details. Exterior width: 3.25". SUEDE & PERFORATED LEATHER UPPER. SUEDE WRAPPED HEEL-4". size 40 9.5-10. MADE IN ITALY. Vince Camuto Heels. Lace up oxford heels. 4.25" heel. Color: Black. Genuine brown leather and suede uppers. Banana Republic Shoes Penny Loafer. Heel 3.5". Color Brown. MADE IN ITALY. We try to work with everyone to fix any problems you might encounter. Tommy Hilfiger Women's Naomi Pump Black Leather Wingtip Heel US 9. Condition is Pre-owned. Shipped with USPS Priority Mail. NINE WEST (NASO) Black Brushed Suede Leather LaceUp Hidden Platform Oxford Heels. PreOwned in very good condition. Patent trim and adjustable laces. Classic simple design. The heel, back, and toe of the shoe are pebbled leather and the rest is smooth. Cute and classic. Cloudwalker by Avenue lace up, oxford bootie heel. All man made material. THESE HEELS HAVE NEVER BEEN WORN AND ARE IN NEAR MINT CONDITION, THE BOTTOM OF THE HEELS AND THE INTERIORS ARE MINT, BUT THEY HAVE A FEW DEFECTS FROM STORAGE WHICH INCLUDE JUST A FEW FAINT SCRATCHES ON THE EXTERIOR LEATHER WHICH ARE BARELY NOTICEABLE. LEATHER UPPER. COLOR ~ BLACK. 3 1/4" AT WIDEST PART. ~~~~~~~~~~~~~~~~~~~~~~~~~~~~~~~~~~~~~~~~~~~~~~~~~~~~~~~~~~~~. MANMADE BALANCE. Gently pre-owned. Minor wear to uppers and soles. This pair of leather Frye Carson Oxford heels in chocolate brown leather have a perfectly classic vintage Oxford look. Just broken in enough for comfort. Size US 9.5 however I wear a size 10 and they fit me just fine. Made to last for years. Frye Stella Oxford Brown Leather Shoes Slip On Block Heel Woman’s Sz 7.5 M EUC. Condition is Pre-owned. Shipped with USPS Priority Mail. Pre-owned but in. excellent condition. The color is a dark reddish-brown. They are shiny, similar to patent leather. Heel height: 3.5". MODEL: Nelly. HEEL: 4 in. - platform sole 1 in. STYLE: modern lace up heels. CLOSURE: Lace up. MATERIAL: Leather upper, leather lining / leather sole. White Mountain "Linette" made in Brazil. Model: Linette. 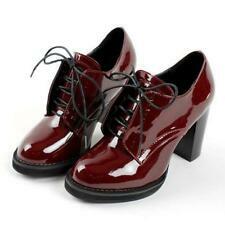 Very rare model LINETTE oxfords wingtip lace up shoes-bootie for lady from luxuries collection White Mountain. Excellent quality. Very stable block high heels. Wingtip stitching; lace-up front. Chunky black heel. Leather uppers with human-made bottoms. Light scuffing to toes and exterior leather. Think Outside The Box. Soles are dirty/show wear. Dust Bag included. 3 in heel height with a slight cushioning on the bottom so they feel very comfortable. CAMPER ANOUK LACE UP BLOCK HEEL BOOTIES IN BLACK. FITS 8, UP TO 8.5. 3.25" heel height with a 1" platform. USED CONDITION. 9 M, 3" heel, good condition. 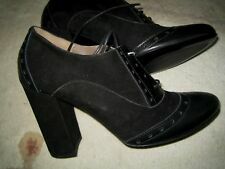 This item up for sale is a very nice pair of Etienne Aigner oxford heels size 6. These oxford shoes have wingtip toes with 3" heel. These shoes feature an closed with a block heel that lace up. They are a size 9M. The Shoe's are made by Liz Claiborne. The shoes have the texture of an alligator. The shoe's are a Dark Brown. Good Quality well made. This is a pair of Franco Sarto. shoe has leather upper and. These are a pair of cute "XOXO shoes. 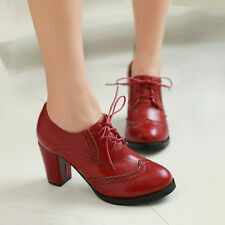 Oxford style high heels. Two tone black shoes. Classic shoes from G.H. Bass & Co. Otherwise in good condition. See photos for full details. Features: lace up, black cap toe oxford lace up with a block heel, leather.